Our Rules: You must always wear your colors. Over 50 must wear purple clothes and a red hat, the bigger the better. Under 50 must wear lavender clothes and a pink hat, again, the bigger the better. You must attend at least 6 outings per year. You are to have fun, fun, fun. No complaining is allowed. Our toast: We're Classy and we're Sassy and we have a Hattitude, and when we're with our sister hats there's never a bad mood. We like to play and dress up too in our red and pink styled hats, and find wearing shades of purple and friends is where it's at. 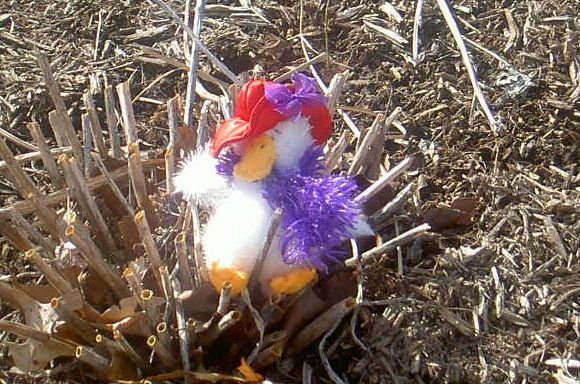 Our motto: We don't give a quack. Remember, Gaudy is good but Outrageous is better. Let's all join in - It's not the prize, it's the game, and it's not the win, it's the play. You gotta come out and play to have the fun. When we start getting stressed, just remember this story to bring you back to what is really important. cup, we fail to enjoy the coffee God has provided us. He brews the coffee, not the cups ... enjoy your coffee. 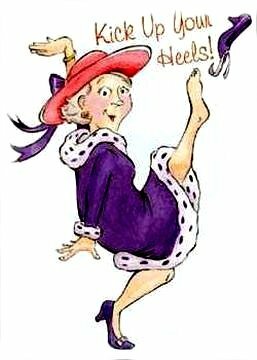 The Red Hat Society began as a result of a few women deciding to greet middle age with verve, humor and elan. We believe silliness is the comedy relief of life, and since we are all in it together, we might as well join red-gloved hands and go for the gusto together. Underneath the frivolity, we share a bond of affection, forged by common life experiences and a genuine enthusiasm for wherever life takes us next. 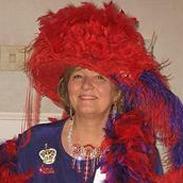 The Red Hat Society was started by Sue Ellen and four friends on April 25, 1998. Red Hat Society Day is April 25th. We are loaded with natural gas!!! Calendar is in the works and will be on line shortly. usually find a line of women, so you smile politely and take your place. knocking down the woman leaving the stall. paper!" Your thighs shake more. the line points out a piece of toilet paper trailing from your shoe. you so long, and why is your purse hanging around your neck?" and hand you Kleenex under the door! could describe it so accurately! It's only great being a queen when you have a super court. We need to wash our mouths out with CHOCOLATE!